It has been 7 months almost to the day since I boarded the plane at JFK and landed in Japan. There is still much I need to experience while I live in Tokyo. After my trip back to the States I feel I will have a bit more of that ‘pick me up’ needed to set out on more adventures. As for now, while I’m en route to NYC I’ve made a list of things I look forward to doing while back in the good ol’ United States of America. My summer ‘home leave’ will officially begin as soon as I meet my sister and Sarah (a pal who I’ve known since kindergarten) at some fabulous NYC restaurant. After that I’ll be spending my next couple weeks split between 4 cities with lots of friends and family. I’m sure I’m not the only one traveling this summer, where are you off to? By now anyone who has kept up with my Ireland posts can tell how much pull the country had on me. 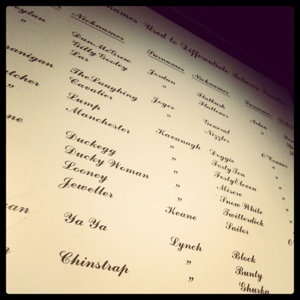 In part, Ireland was the first ‘english’ speaking country I’d been in for 7 months. So having complete awareness and the ability to communicate throughout all social and day-to-day activities was very engaging. The friendliness of Dublin reminded me of my roots in the Midwest and how intentional people can be in going out of their way to greet you or help you out. In addition, the food had a certain Midwest heartiness to it, the meat and potatoes really stuck to my bones! 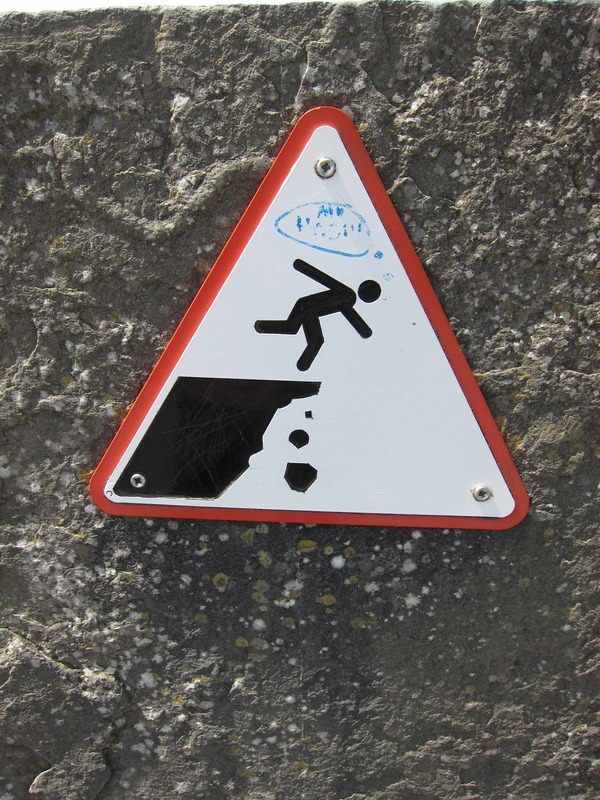 On the other side, I’d say the grit factor brought me back to Earth. Tokyo has a tremendously safe culture, if I were to leave my purse at a restaurant (as I did the other night) or on the bus it would 99% with certainty be returned to me intact. And that’s one amazing social quality attributed to TK! Having a change of scenery allowed for time to reflect on my past 7 months overseas. Being in Dublin reminded me how far I’ve come living in Tokyo as a ‘dependent’ housewife and how much one can adjust to or accept a new culture. At the same time, being pulled out of the hustle and bustle of Tokyo helped remind me how much I have come to appreciate and enjoy day-to-day life in Japan. (Thank you Mr. Cakes). As I prepare for home leave I look forward to my time reconnecting with NYC, Chicago, and other parts of Illinois. In addition, catching up with family and friends will only further encourage me as I pass the half way mark on my overseas adventure. I feel like I should have titled this one ‘Dear Online Journal’? I will be back to TK soon enough! Lots more adventures to discover and share. Happy June! 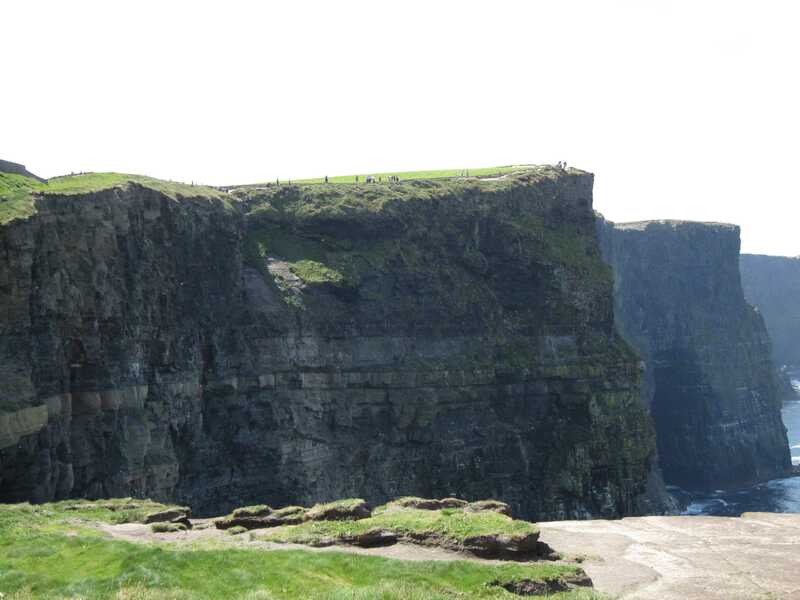 My plan for Dublin was to see Cliffs of Moher (check), drink Jameson (check) and spend a day at Powerscourt House & Gardens. 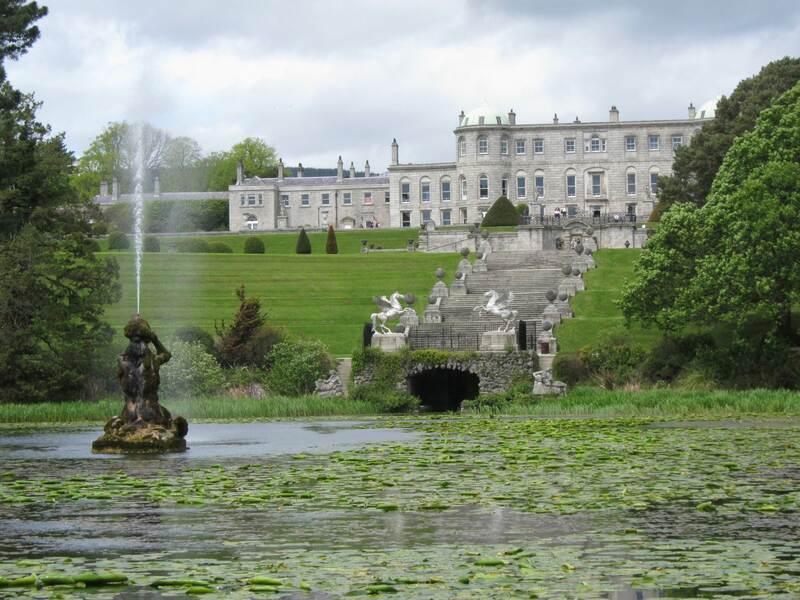 Once again I decided to take a bus tour down to Wicklow County where the estate is located. 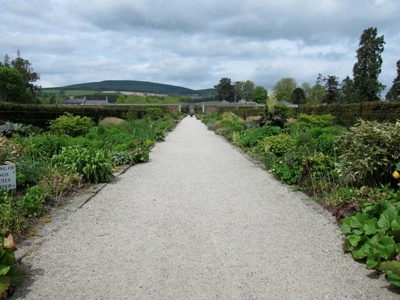 With about 47 acres to cover I knew I would have a relaxing afternoon walking the gardens and exploring the house. The house is actually restored from a devastating fire that occurred in 1976. You can read more about the history here. The ballroom was not open to the public the day I visited. There was a lovely gift shop and a large furniture showroom on the second floor. To make the most of the weather I immediately entered through the visitor center to gain access to the gardens. Walking out from the building on to the ‘gardens’ I was not disappointed. In the snap above the house is to my back and Sugarloaf Mountain in the distance (adore the name). 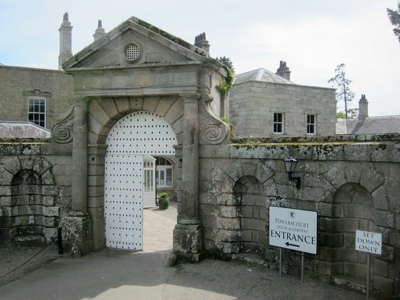 Below you can see a stunning view of the house. There are many areas to see! 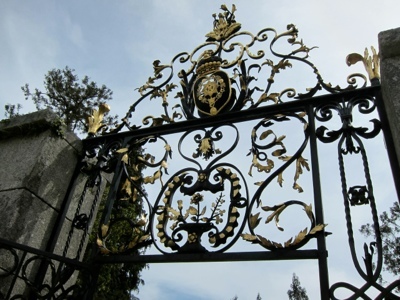 I spent my time strolling around the ‘Walled Garden’, ‘Pets’ Cemetery’, ‘Japanese Garden’, and close to the house admiring all the gates. 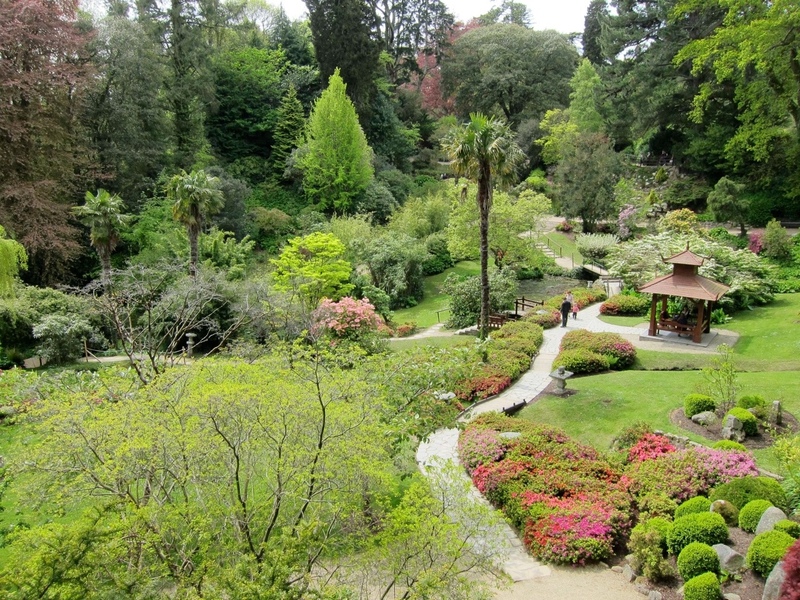 Nothing like a Japanese Garden in Ireland, how suiting! All in all I was very pleased with the day trip. 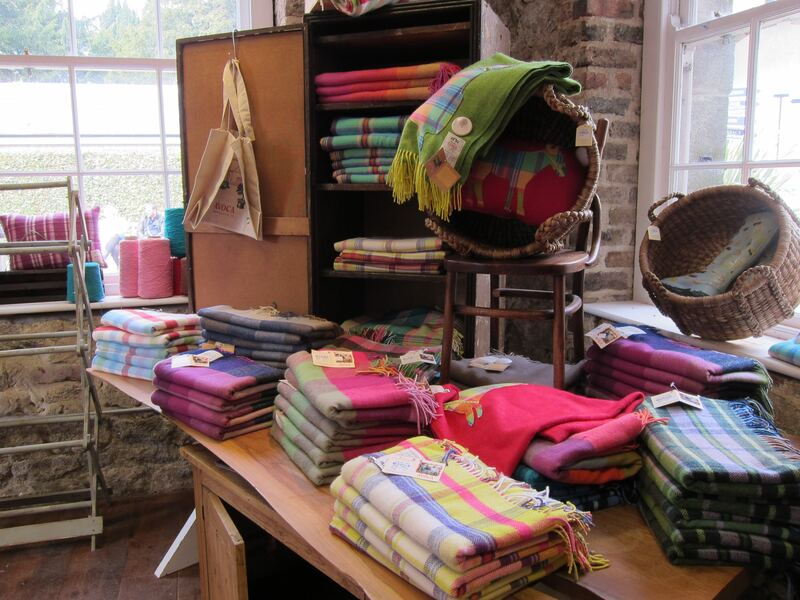 Before the bus pulled out of the drive I hit the gift shop and what do you know, I found the perfect wool throw. 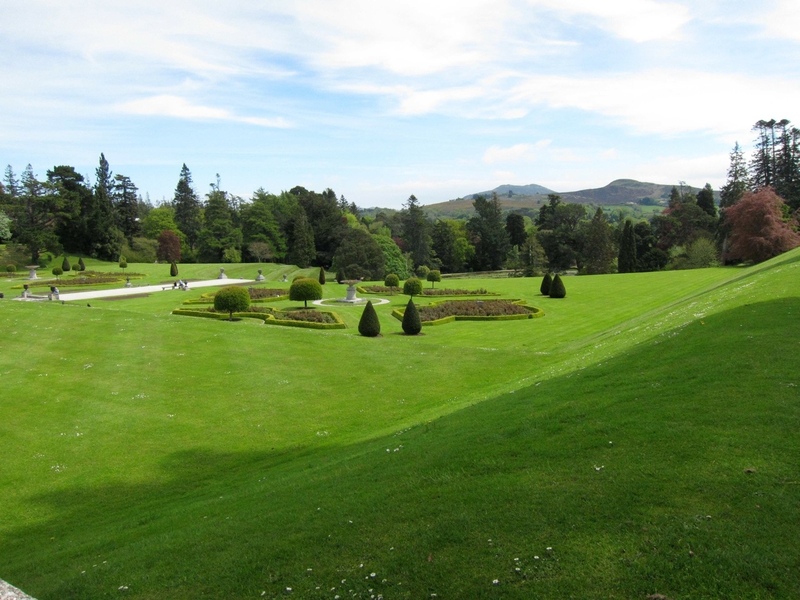 Not only do I look forward to cooler temperatures to break it in, but having the memory of visiting Powerscourt House & Gardens on my first trip to Ireland! One day in Dublin I found myself at 5pm with an open agenda. So I decided to take the Jameson Distillery Tour. Located at the original brewery address on Bow Street the building is now home to a restaurant, gift shop and the visitor center. 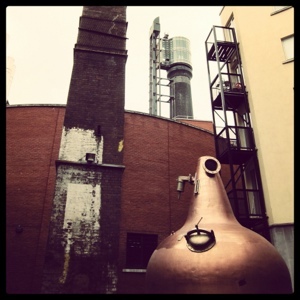 The actual distillation now takes place in Cork (saving that tour for my next adventure to Ireland). 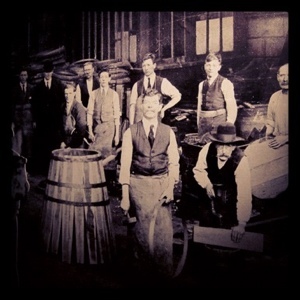 In 1780 John Jameson, a Scottish businessman acquired the distillery and by the turn of the 19th century it was producing 1 million gallons annually. 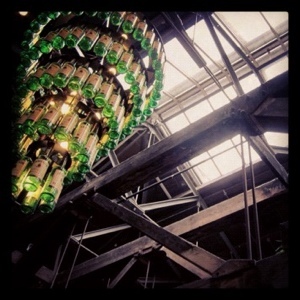 Present day, Jameson is the world’s third largest single-distilled whiskey and the most popular whiskey sold world-wide. Upon entering the visitor center one will see a most appropriate chandelier! 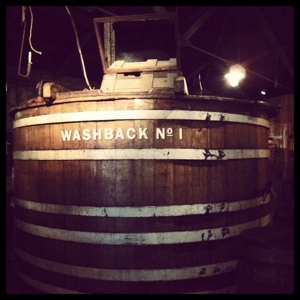 The main room used to house the original mash turns. Under what is now the bar, one will see the circular brick walls that were needed to support the mash turns. 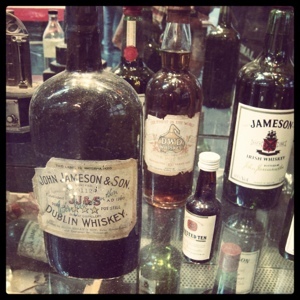 There were many antique bottles of Jameson on display, most were already enjoyed but a few remained intact. The actual tour takes you through a scaled down version of the entire process of creating Jameson Whiskey. It begins with a video (super cheesy reenactment of John Jameson in 1776), from there the tour guide brings you into a mock warehouse where the barley is stockpiled. Jameson uses a mixture of malted barley and unmalted or ‘green’ barley all sourced within a 50 mile radius from the Cork Distillery. From the warehouse the tour continues to the drying and malting of the grain. 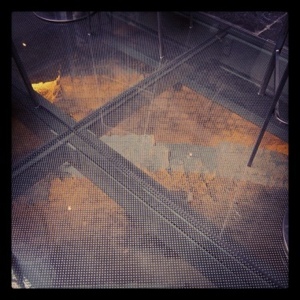 The tile below is from the original floor in one of the drying warehouses. 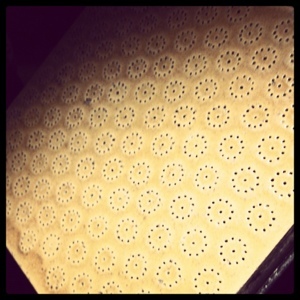 I thought the pattern incredible sweet and attractive, in reality the perforations served to help dry out the barley. Next up, the waterwheel, which provides water for the mash and powers the mash mixers. Then the distillation in 3 separate copper pot stills. 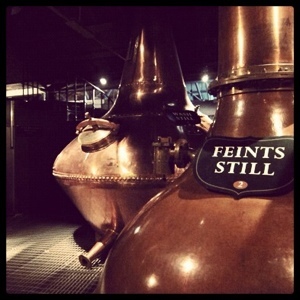 The wash still, feint still, and spirit still, all of which create the triple distillation which is said to produce a higher purity of whiskey. The final stage is the aging process. The raw materials used to build the barrel helps to determine the flavor and different taste aspects of the whiskey. 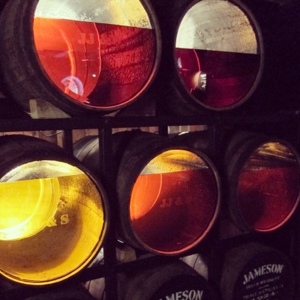 Below, the barrels showcase the aging process and how the color changes. 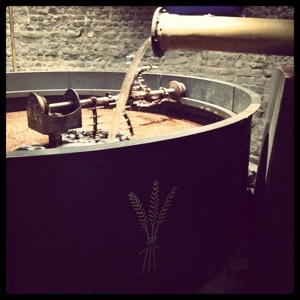 Along with color, notice how the ‘angel’s share’ increases (amount of evaporation which occurs during distillation). Bottom Left is 1 year, middle is 3 years, right is 5 years, on the top row the left is 10 years and the right is 18 years. At 18 years the top right has the most amazing color! I’ve heard people speak passionately about the color of whiskey or scotch, but it was the first time I actually understood! A really rich caramel color. The black and white photo above is from the old distillery. The roster below is interesting. 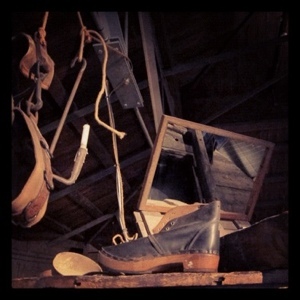 Many of the employees at the distillery were family, which meant lots of the same last names. In addition to last name, the tour guide mentioned that at that time the male children were often given the same first name as their father. Meaning there would be 5 John Kavanagh’s or 6 Jamie O’Conner’s. To to keep the employees straight, everyone had a nickname. Some of the names were self assigned, but our tour guide explained the funniest nicknames were those not self assigned (rather given by some embarrassment). Finally, the tasting. No picture required. I enjoyed my Jameson with a splash of water! From time to time Mr. Cakes and I enjoy treating ourselves. 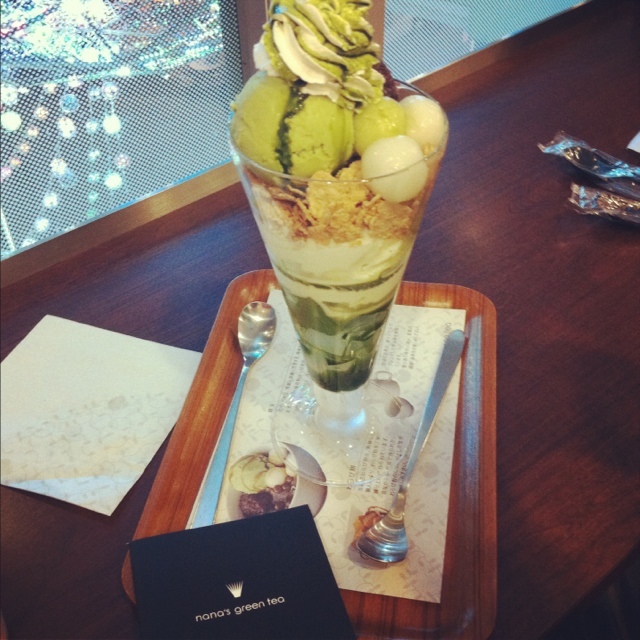 My favorite ‘treat’ is a green tea parfait. We generally split one, but there are occasions when one needs one’s own. At Nana’s Green Tea the parfait layers are unusual compared to one from DQ. The base contains clear gelatin cubes with a green tea syrup topped with ice cream and more syrup. Then corn flakes, a scoop of green tea ice cream and 3 mochi balls (rice beaten to a pulp and then shaped into balls) are added. Not forgotten is a side of red bean paste and finally a healthy swirl of real whip cream and a drizzle of green tea. Oyshii! Between the 2 of us the entire parfait is always wiped out. The corn flakes are a real winner with the ice cream. In fact my 3 favorite components to the treat are the flakes, mochi, and whip cream. Since Mr. Cakes enjoys the green tea and vanilla ice cream with the red bean paste I’d say we make a great pair! As the weather heats up I’ll have no problem suggesting we ‘Treat our Selves’ regularly!! 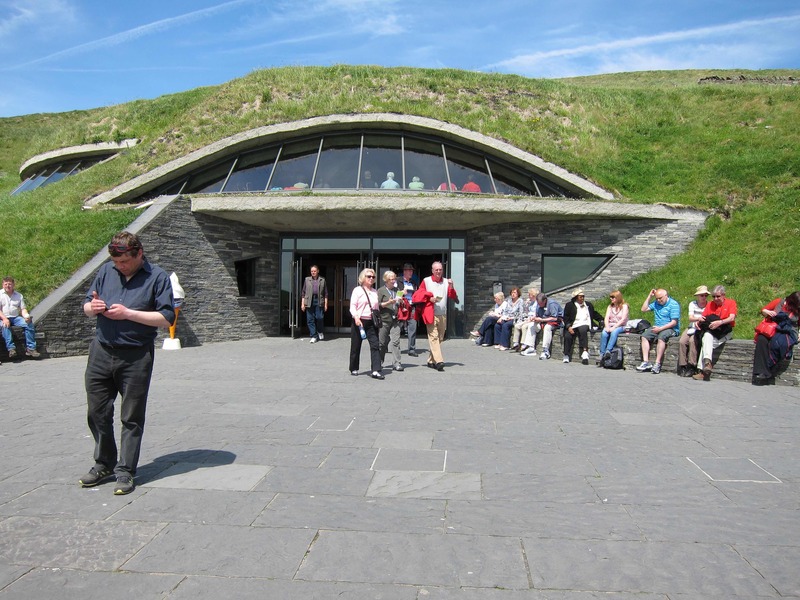 A great way to see Ireland is by taking advantage of all the bus tours. There are many options for day trips to the countryside. 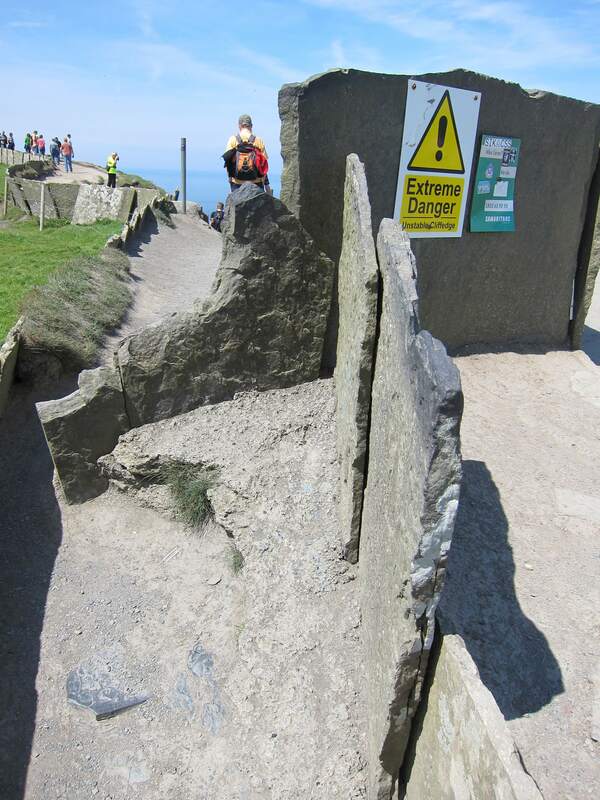 I planned ahead to ensure I had a seat on the trip to the Cliffs of Moher. My tour group met at 6:50am and were on the road by 7am. 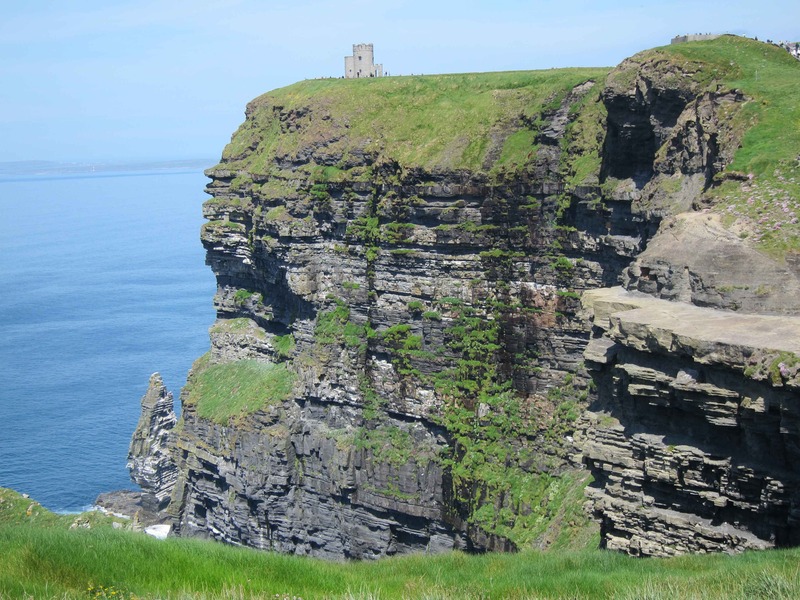 Located on the West Coast of Ireland the cliffs run about 5 miles long and rise about 700 feet from the Atlantic Ocean, 400 feet being above sea level. 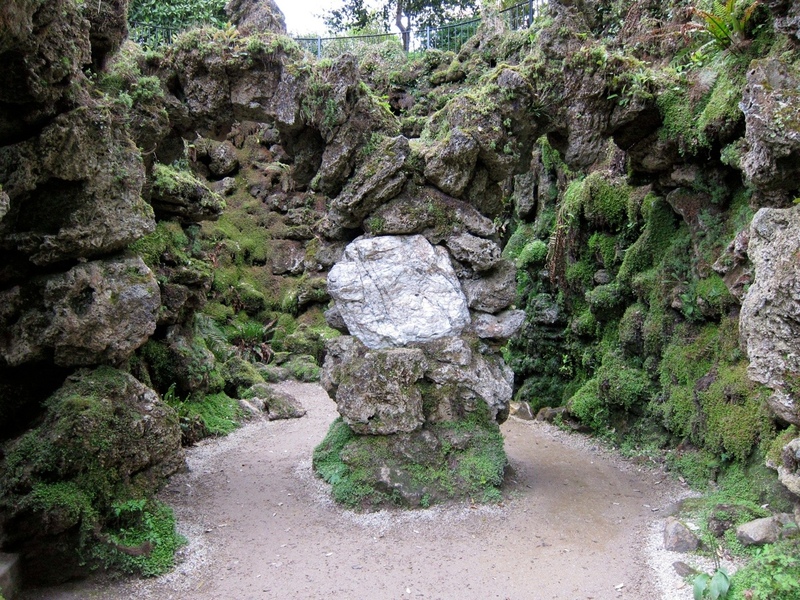 The cliffs were originally the site of a huge river delta and are said to be formed over 300 million years ago. 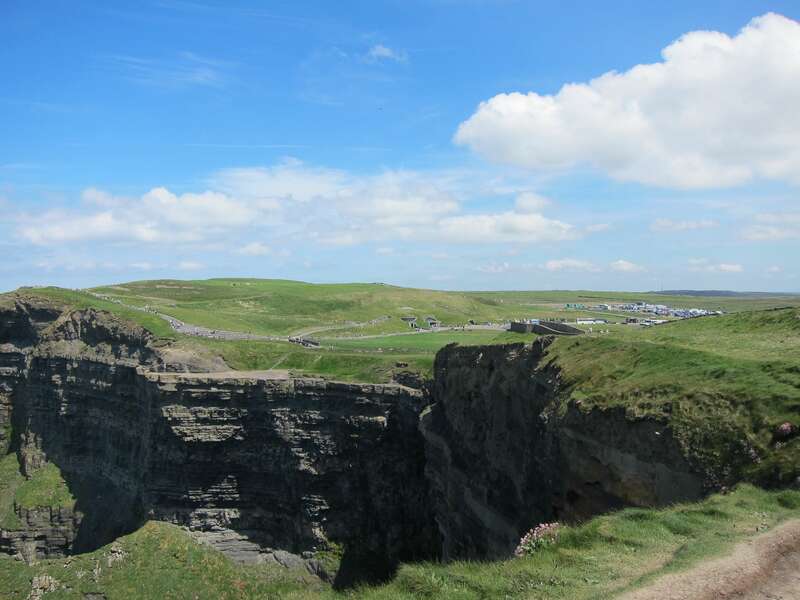 In addition to a wonderful tourist destination the cliffs are home to some 30,000 birds! There are at least 20 species of birds, one of which is the Atlantic Puffin! I didn’t have the chance to see one. They to come to shore in April and May to nest, but nest in the cliffs which makes it difficult to find them. There were plenty of hawks, gulls, and ravens to view, flying around enjoying what must be the best view! From the parking lot you can see the visitor center. Designed so that guests are not distracted by ‘man-made amenities’, the site is built into the natural landscape. It’s quite amazing, and very well thought out. Past the visitor center one is met with the most amazing view. There is really no way to capture or believe the images below unless you see it in person. I only wish I had the means to transport everyone I know to this beautiful landscape. 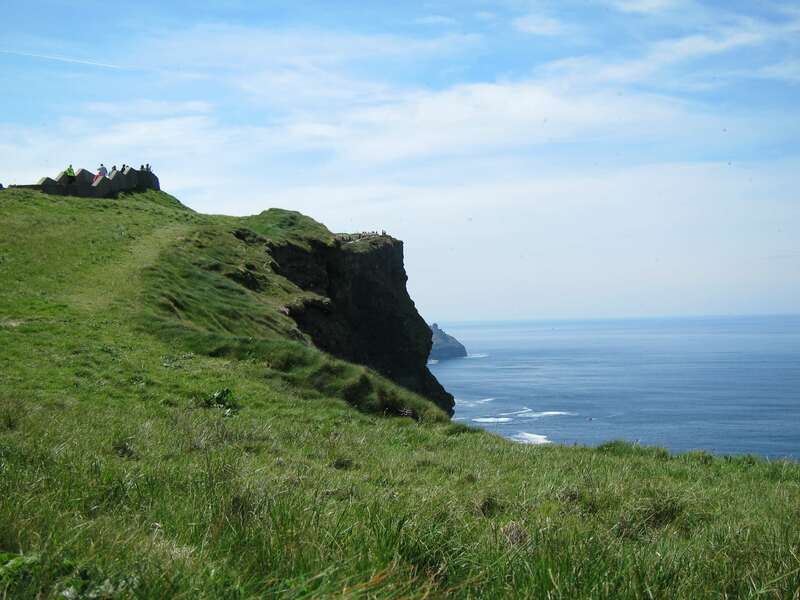 I spent about 3 hours (carefully) walking along the cliffs and stopping along the way to breath in the air and enjoy the scenery. The weather could not have been better! A bright day with a slight breeze from the Atlantic made for the perfect visit! With the sun shining down it was one of the most unbelievable days I’ve experienced in my life. There was so much to just look at and appreciate. Ireland was definitely a ‘green’ country. The color of the landscape was extremely vivid and absolutely inspiring. 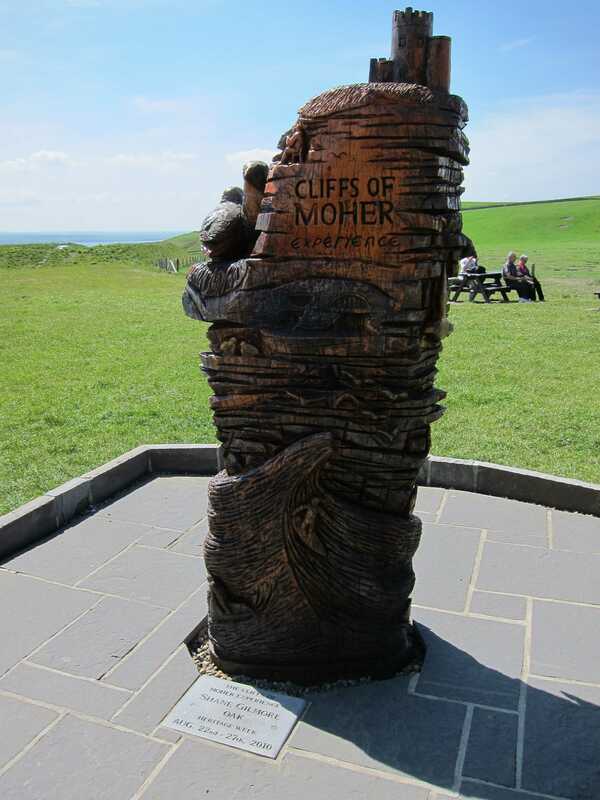 Once the tour left the cliffs we stopped in Doolin for lunch. Hard to believe such a lovely and peaceful afternoon could work up such an appetite. But when in Ireland. 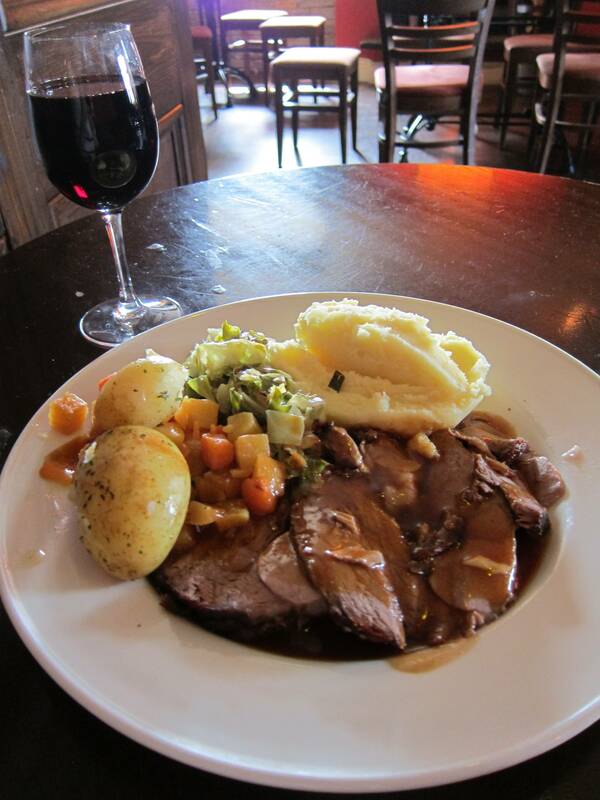 . . roast lamb, greens, 2 types of potatoes and some vege. Delicious! The perfect way cap off a fantastic day! Last week I had the privilege of joining Mr. Cakes on a work trip to Ireland. 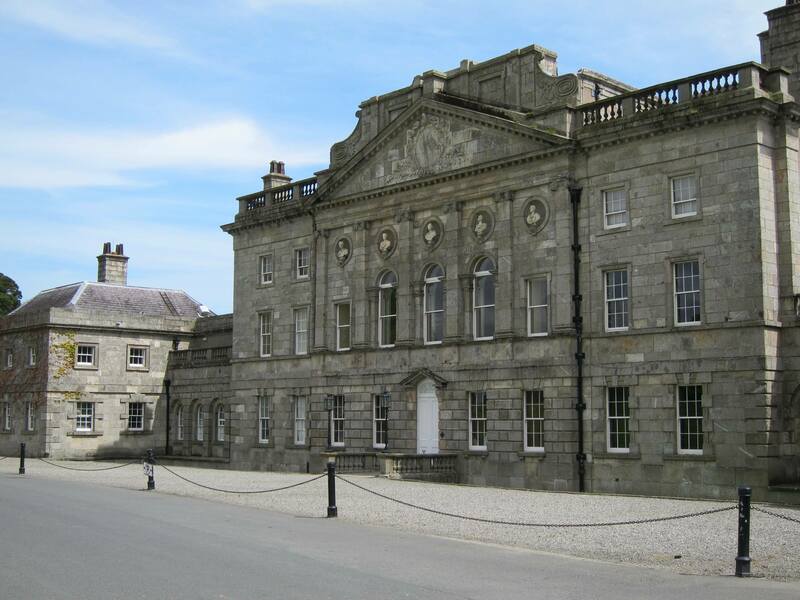 Although we stayed in Dublin I had the opportunity to take a couple of day trips to the Northern and Southern parts of the country. I can barely put into words how much I adore Ireland! I was terribly sad to leave and could only step on the plane because I knew we’d be back for a proper holiday sometime in the near future. 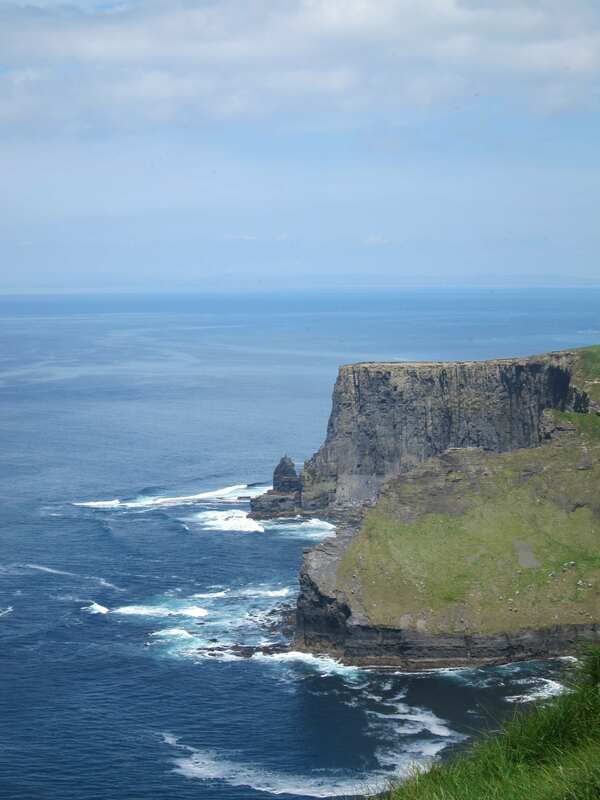 To sum up my travel experience in Ireland I can say: the people are eXtremely friendly, the food is fantastic, prices are reasonable, and country as a whole is beautiful. 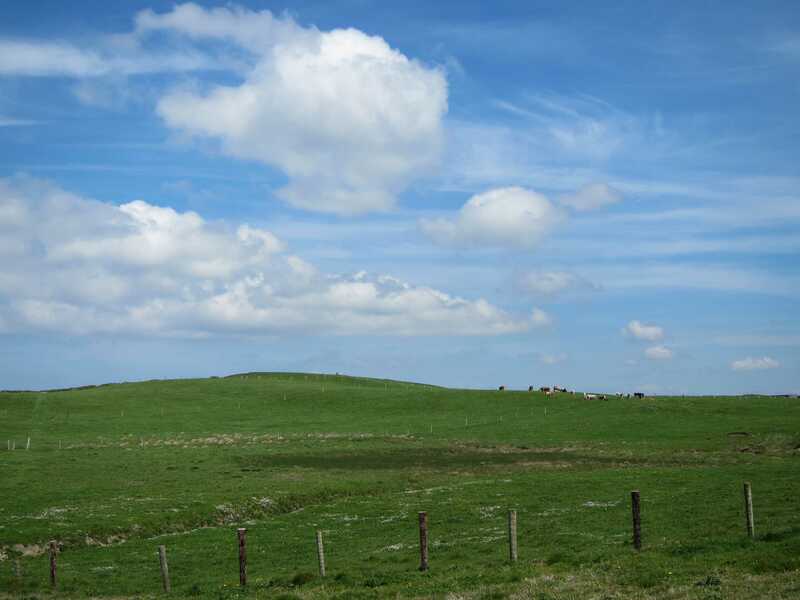 Dublin and the surrounding countryside have a much different landscape than anywhere I’ve ever been. I had my fair share of ‘pinch me’ moments! Oh, AND the weather was absolutely amazing! No rain, not even a drop. We spent the week with daylight from 6am – 9pm with temperatures in the high 70’s – low 80’s. It couldn’t have been more meant to be, for a last-minute trip. Dublin itself is a smaller city (in comparison to NYC or TK) with the feel of Philly and Boston combined. My personal impression is that people are hard-working, yet take time afterwards to drink, sing, play music and truly appreciate the pleasures in life. 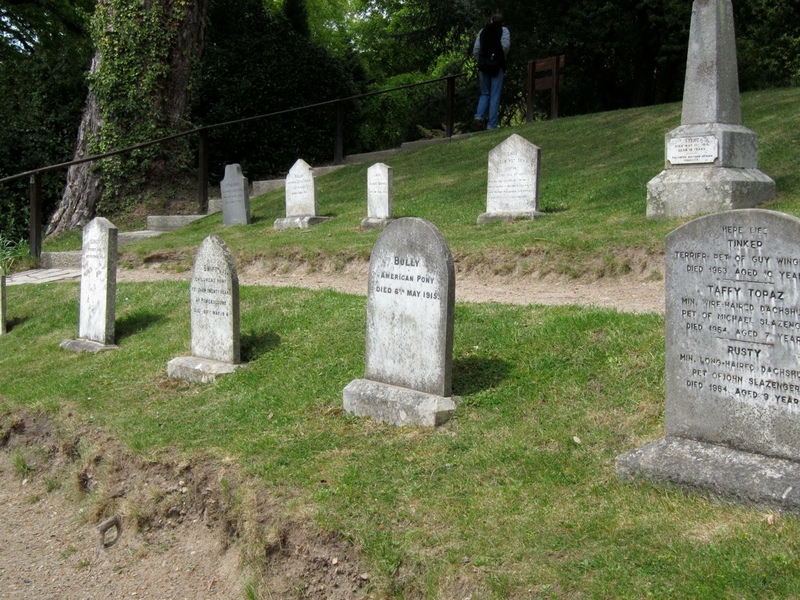 I hope you enjoy the following entries on Ireland. Like I mentioned earlier, words, photos or even video cannot convey the spirit and loveliness of Ireland. I highly suggest bumping up this country on your travel list. Especially if you’re like me and prefer beautiful scenery with good food and drink. Slainte! The past couple weeks have been full of friends, travels, and of course fun! Bare with me while I catch up on entries about my recent adventures. In no time I will be back to a regular post schedule and plan to maintain it even as I prepare for my home leave. 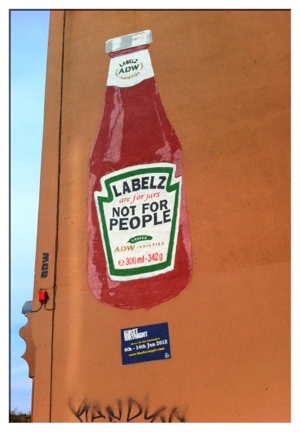 Dublin had a vibrant street art scene. The city and surrounding areas had so much to check out and enjoy. I look forward to sharing more snaps and details of my time overseas! 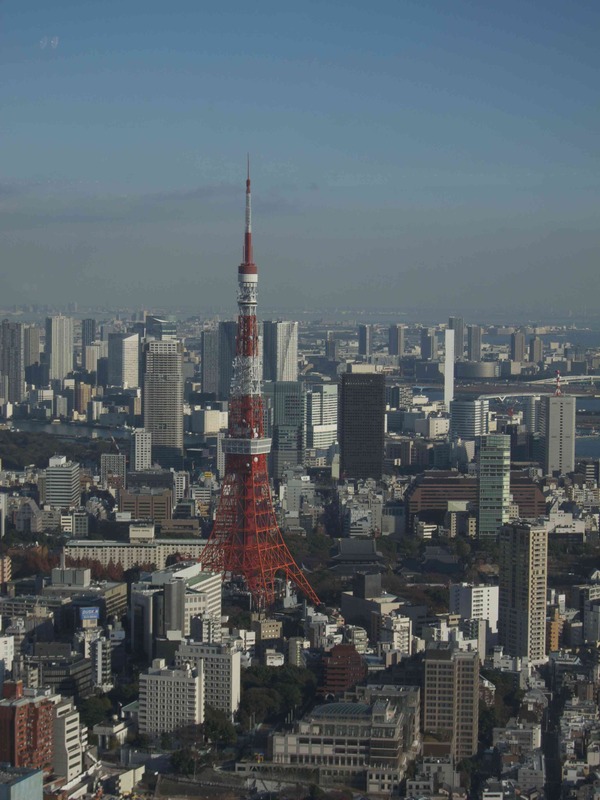 One of the most recognizable landmarks in Tokyo is none other than the Tokyo Tower. 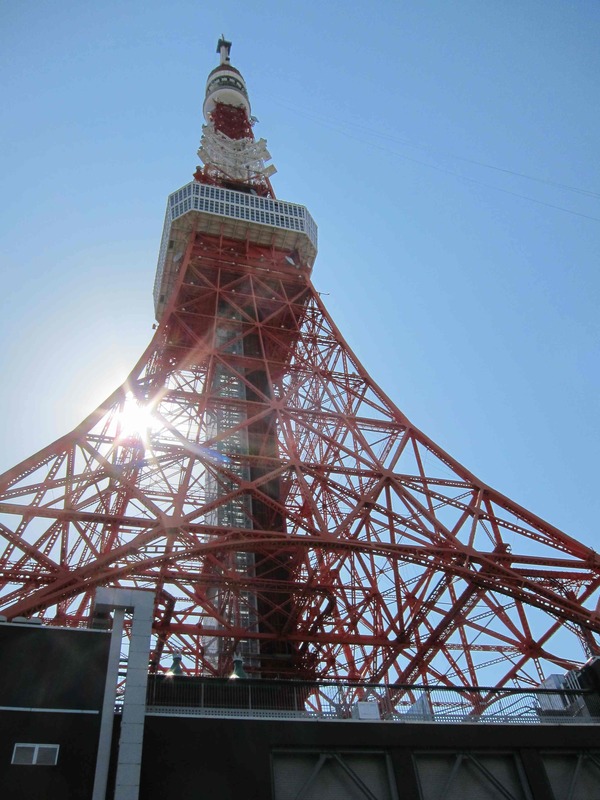 Located in Minoto-Ku, Tokyo Tower was inspired by the Eiffel Tower and is used as an observation deck and for broadcast communications. The tower broke ground in June 1957 and was opened in December 1958. 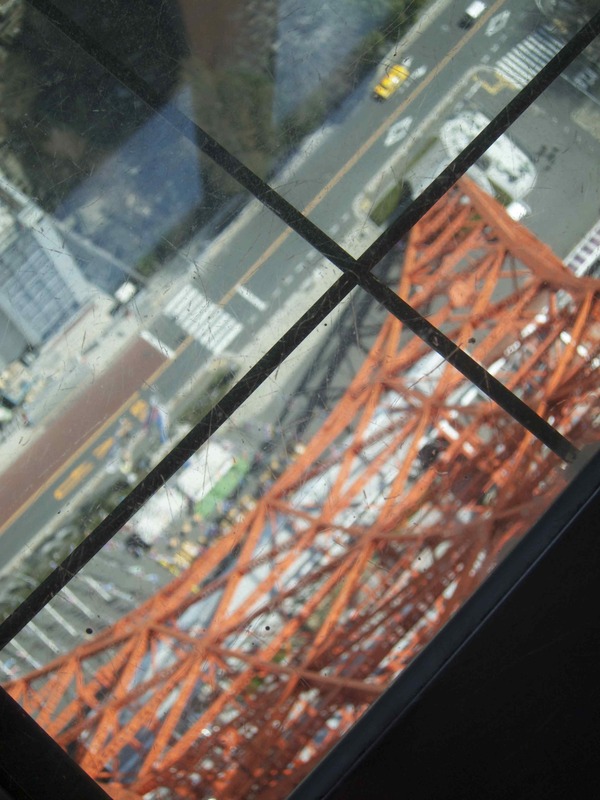 Here you can see Tokyo Tower as viewed from Mori Tower. It certainly stands out in the high-rise, beige landscape of the city. There are 2 observations decks. 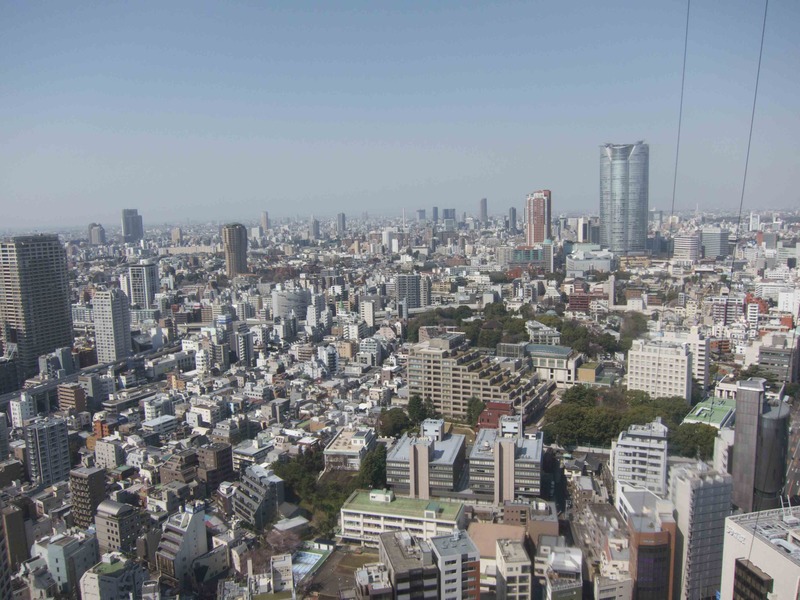 Here is the view from the ‘Main Observatory’ deck at Tokyo Tower. The ‘Special Observatory’ requires purchase of another ticket, which I decided against this visit. The tall building on the right (silver) is Mori Tower. 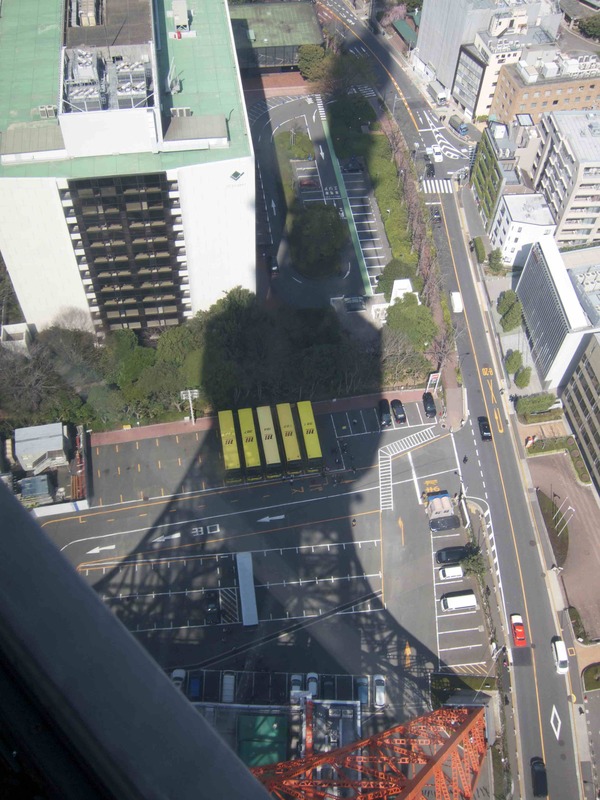 Although thin, Tokyo Tower casts a very large shadow! At 145 meters high, the Main Observatory floor provides several ‘look down windows’. Below the tower I noticed all these ‘flying fish’, or Koinobori. 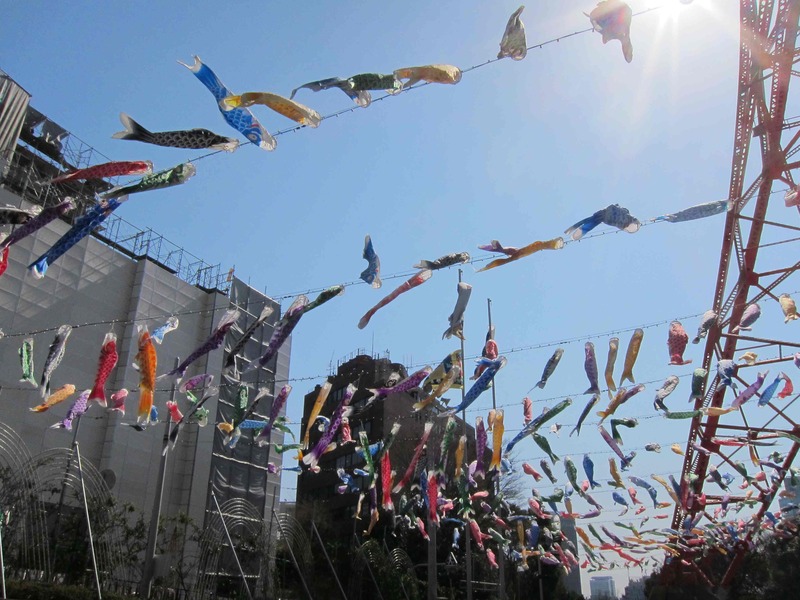 Koinobori is a carp wind sock and hung outside during April and May to celebrate ‘Children’s Day’. It’s a holiday that is said to celebrate and honor kids in hopes they will grow up strong and healthy. 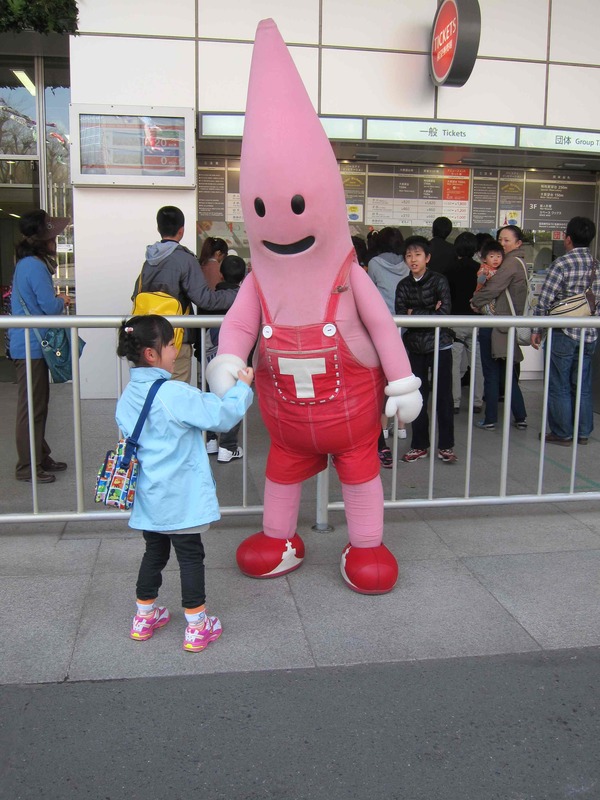 Since arriving to Japan I have noticed that many businesses, landmarks, and restaurants have their own mascot. Tokyo Tower is no different. Here is one of the Noppon Brothers, who represent the tower. This one is the younger brother, who is described as ‘cheerful and lively, but often feels lonely and misses people’. I’m not sure who creates such mascot histories but in addition to their characteristics, that the Noppon Brothers have hobbies! Their hobbies are greeting people and sunbathing while their goal is to become top stars! Gotta admire the Tokyo Tower silhouette on the younger brothers shoes! 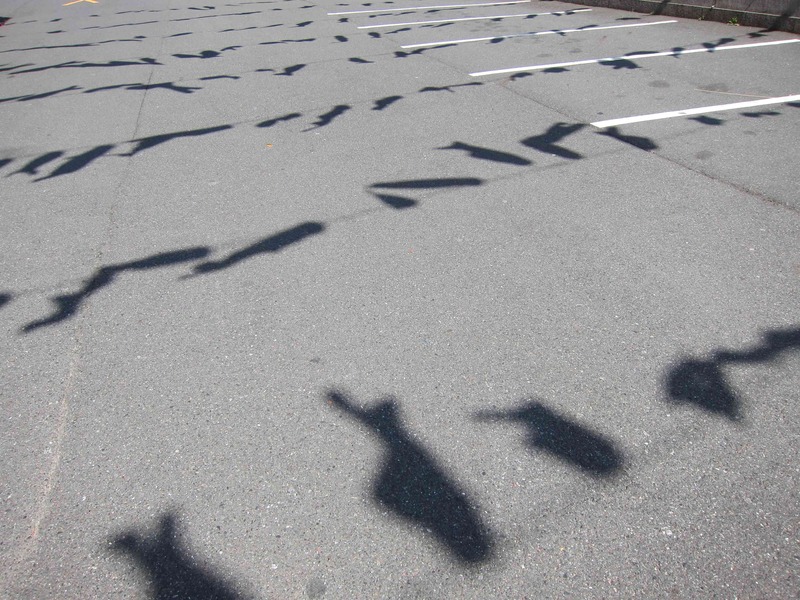 I left admiring the shadows cast by the Koinobori and looking forward to more sunny days in Tokyo! After 6 months of living in Tokyo I sometimes forget share my adventures! 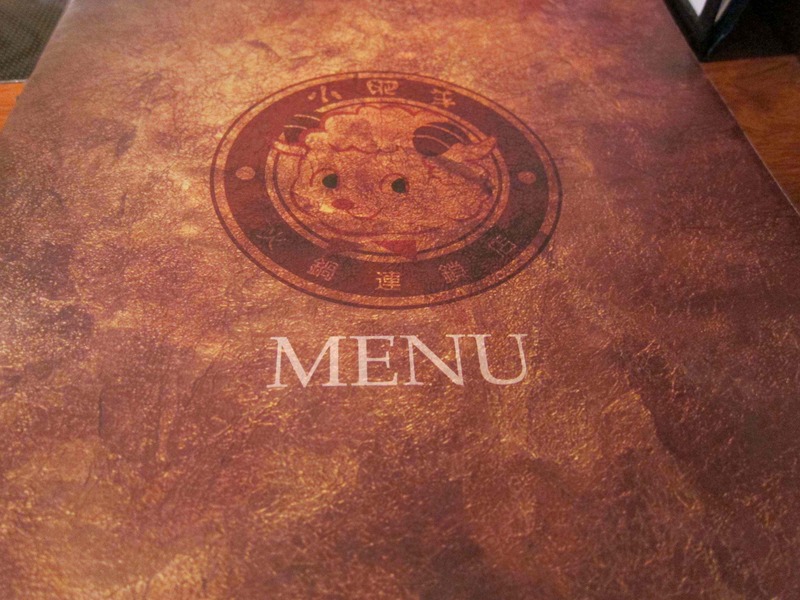 A couple of months ago Mr. Cakes and I spent a full afternoon shopping in Shibuya and were getting hungry. By the time we were ready to eat both of us were indecisive on what we wanted. After wandering around we looked up and found what would become one of our favorite restaurants. 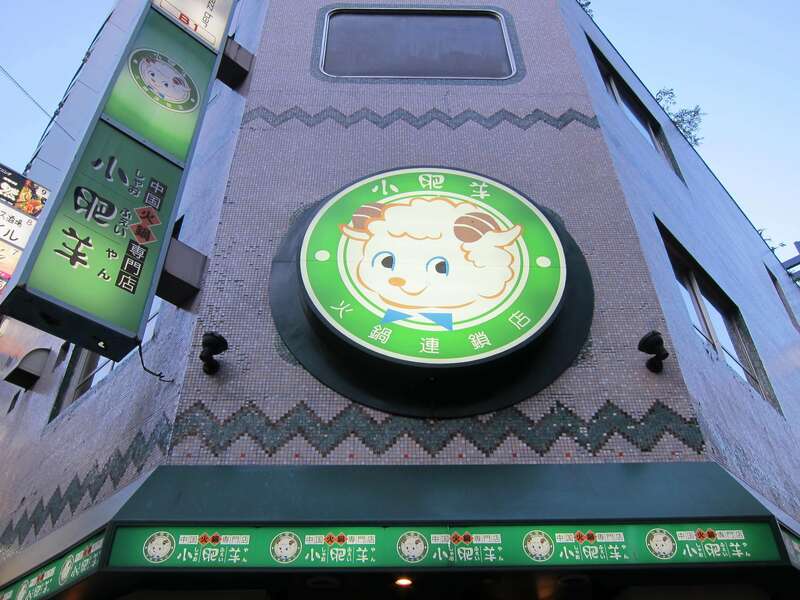 Little Fat Sheep is a fantastic shabu-shabu style restaurant. The boiling broth that cooks the thinly sliced meat and vegetables is Mongolian influenced and therefore contains lots (and I mean lots) of spice and garlic. 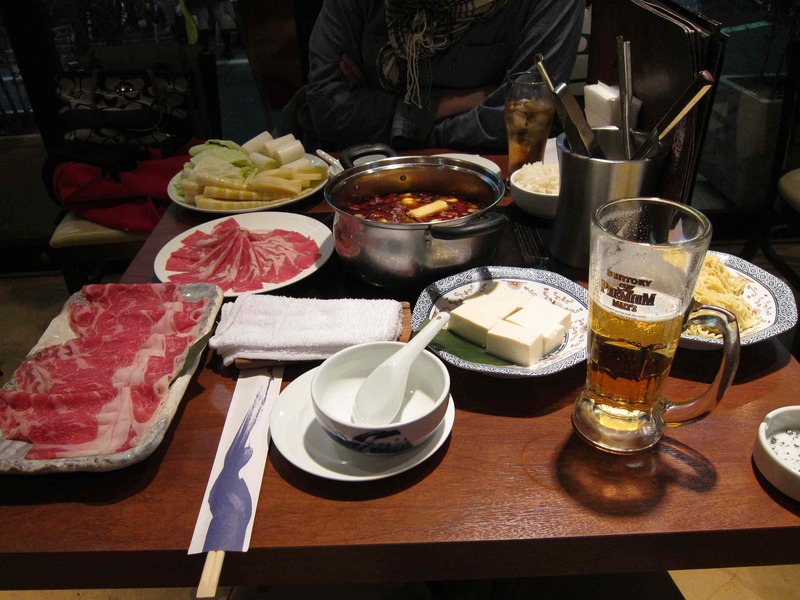 A typical Japanese shabu-shabu is a pot of boiling dashi or kelp broth. One will add vegetables and eventually dip thinly sliced beef (or meat of choice) in the water to cook. 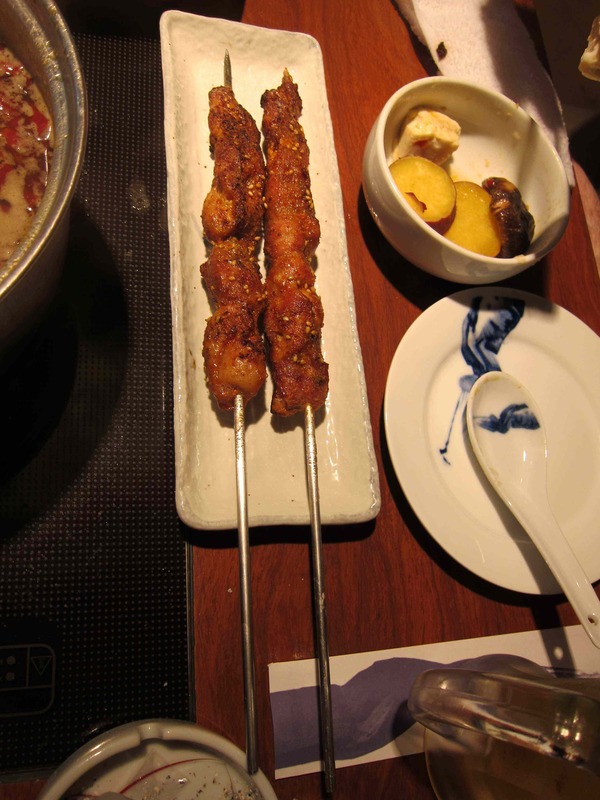 There are a couple of dipping sauces for the cooked meat, one is ponzu and the other is sesame. 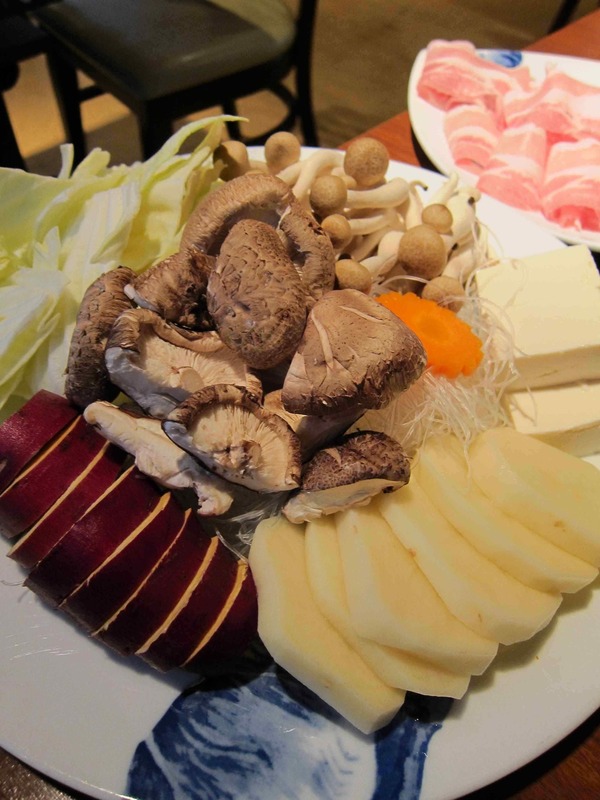 Once I enjoyed my first ‘authentic’ meal of shabu-shabu I knew I had found my favorite food. Having become very accustomed to the general lack of spice in Japanese food I was more than thrilled to walk into Little Fat Sheep and smell the spices! 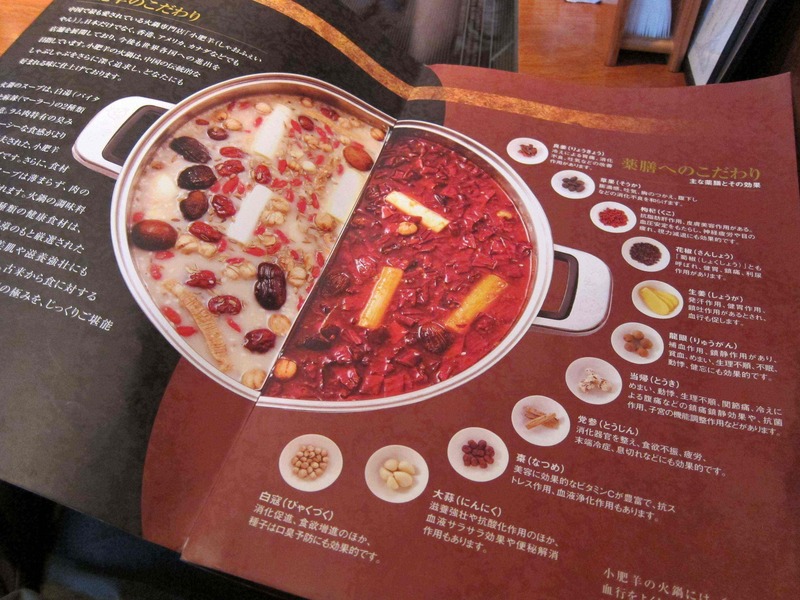 The menu has a guide to what ingredients are added in the ‘hot pot’. There are 11 different items added for flavor. 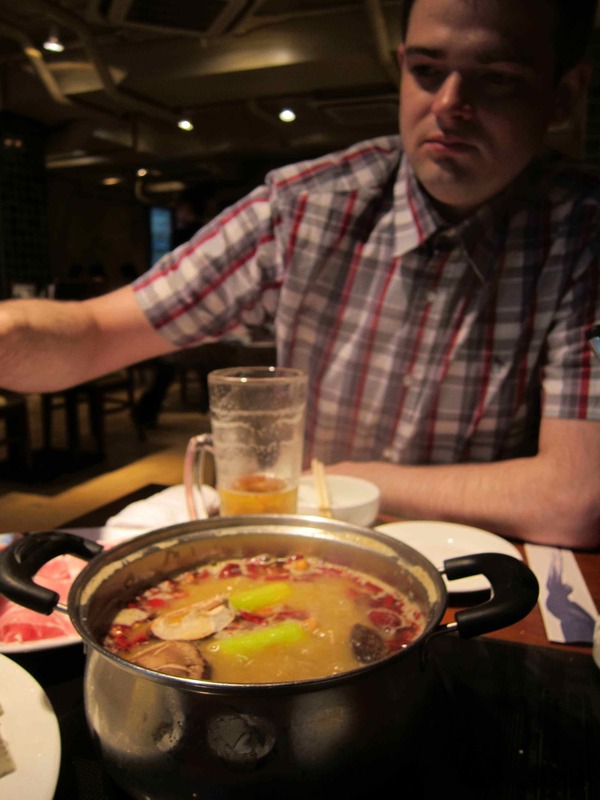 Mr. Cakes, slaving over the hot pot. At least he won’t have any dishes to clean! To help cool the spice we always enjoy plenty of cold beers and lemon sours. 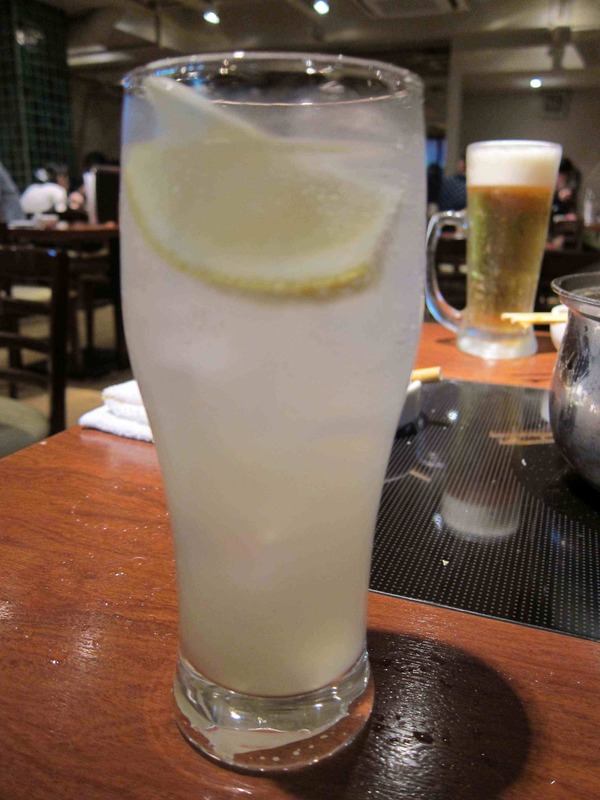 There is nothing better than a tart lemon drink to sip on while enjoying a spicy meal. Little Fat Sheep will always be a favorite spot! 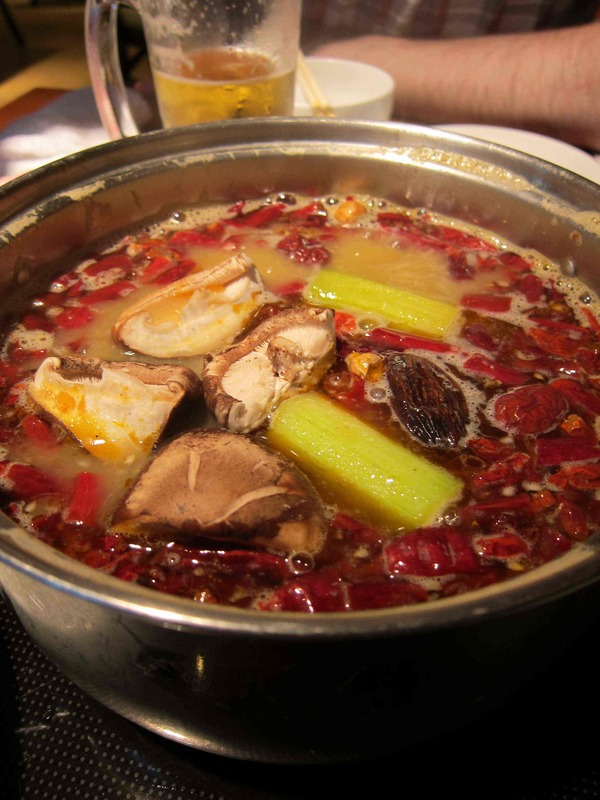 Even in the warmer months to come, the spicy food will help us deal with the heat outside!